. . . All regiments were composed of squads, platoons, companies, and battalions. At normal strength, each squad consisted of 12 men; 10 were armed with M-l rifles, one with a BAR [Browning Automatic Rifle], and one with an M-1903 Springfield bolt rifle (itself an adaptation of the earlier Krag-Jorgenson standard-issue weapon used during the Spanish-American War). Three such rifle squads formed a rifle platoon. Three rifle platoons plus a weapons platoon (armed with one .50-caliber machine gun, two .30-caliber machine guns, three bazookas, and three 60mm mortars) made up a rifle company of six officers and 187 men. Three rifle companies and a heavy-weapons company made up an infantry battalion of 871 men. Three battalions plus a headquarters and support unit constituted an infantry regiment of 153 officers and 3,049 men. It was a group like this that entered combat in the Hürtgen Forest. [the 28th Division's 110th Infantry Regiment reported 2,089 casualties in sixteen days of fighting during the battle for the Hürtgen Forest and that figure may have been too low. Its 3rd Battalion entered the forest with 871 men and it received another 200 replacements during the fighting. A total of 75 men -- just 7% -- were still capable of fighting at the end. Only one officer survived in each of Companies I, K and L. Company M fared the best with four of its officers remaining. The battalion also lost its commanding officer, executive officer, S-2 intelligence officer, S-3 operations officer, executive surgeon, and its medical assistance officer.
. . . The Battle of Hurtgen lasted ninety days. Nine divisions plus supporting units on the American side were involved, more men than Meade had at Gettysburg. The losses were comparable to Gettysburg, too, or the Wilderness. There were more than 24,000 combat casualties, another 9,000 victims of trench foot, disease, or combat exhaustion. 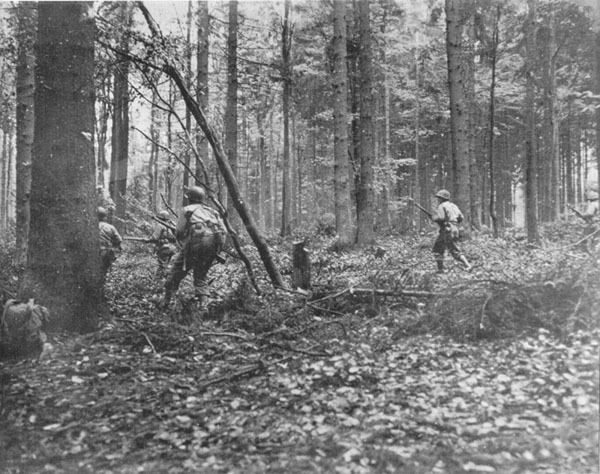 In February 1945 the 82nd Airborne followed a retreating German army through the forest. The 505th PIR got into the town of Schmidt, which had changed hands many times during the battle. The history of the 505th noted that "throughout Sicily, Italy, Normandy and Holland this unit has seen the devastation of war, but never anything to compare with this. There were tanks, tank destroyers, jeeps, 2-ton trucks, other vehicles and all sorts of GI equipment as well as countless American dead. It was no wonder the men referred to this as death valley." Gen. Rolf von Gersdorff commented after the war, "I have engaged in the long campaigns in Russia as well as other fronts and I believe the fighting in the Hurtgen was the heaviest I have ever witnessed." Still, the Germans were delighted that the Americans wanted to throw their weight into an attack against dug-in troops in a forest. 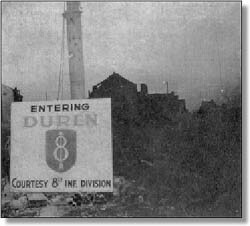 "On 23rd November the battalion was attacking a superior German force entrenched on an excellent position. The only thing that higher headquarters contributed to the debacle was pressure, and God only knows where the pressure started, perhaps Corps or perhaps Army. It had the effect of ordering men to die needlessly." O'Grady was furious: "Tactics and maneuver on battalion or regiment scale were conspicuous by their absence. It never seemed to occur to anyone that the plan might be wrong; but rather the indictment was placed on the small unit commanders and the men who were doing the fighting. The companies went into battle against the formidable Siegfried Line with hand grenades and rifle bullets against pillboxes. The 84th Division walked into the most touted defensive line in modern warfare without so much as the benefit of a briefing by combat officers." The Americans took the forest but lost the Battle of Hurtgen, and too many good men. The battle did not shorten the war by one minute. For those reasons, it is remembered today by those who were there. The Americans had taken Aachen and Metz, and the Hurtgen, but at such a cost, in time and lives, that for those who were not there these great battles are hard to recall. As Lieutenant Lomell put it, "The months-long battle of the Hurtgen Forest was a loser that our top brass ever after never seemed to want to talk about."